A coffee table is pretty standard for your living room. Not only does it provide a practical place for you and guests to rest a drink or snack tray, but it also serves the design purpose of tying the room together. But if you have a small space, a coffee table may seem like a luxury in which you can’t indulge. Or you may wish that your coffee table could do more than serve as the occasional place holder for drinks and snack food. Most coffee tables are about knee-height or a little lower, which is perfect for holding your drink or giving you a place to rest your feet while you’re watching TV on the couch. 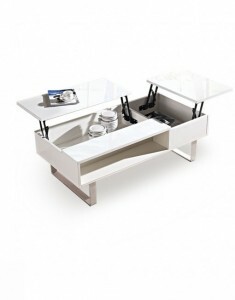 But if the coffee table was a little higher, it would work just as well as a place to eat dinner in front of the TV. Lifting tables provide that functionality. The table top sits on a pair of crossed legs that can lift just like a jack does for your car. Pull the two legs closer to elongate the “X” that they make and lift the table higher. With this adjustable coffee table, you won’t have to interrupt your Netflix binge session to eat, and you don’t have to worry about getting crumbs all over your couch when you eat with a plate in your lap. Some lifting coffee tables have hidden legs that are only visible when you convert it to a dining table, and some have lift-up eaves that create a traditional round shape from the rectangular table. If you have a small home or apartment, a lifting coffee table can also give you a formal place to eat meals even if you don’t have a dedicated dining room or kitchen nook. You won’t have to take up any more space than a typical coffee table occupies. Some space-saving coffee tables are no bigger than an end table. They offer just enough surface area for a conversation piece at the center of a seating group. An expanding coffee table can go from this small square shape to a modestly sized dining table that can accommodate four. The top rises like with a lifting coffee table, and then the eaves expand out to create a larger surface area. You and your partner can eat dinner each evening without having to set up a separate dining area. If your home has a kitchen nook or dining room, you can use that space for other things, like a small study area or home office. An adjustable coffee table does a lot more than just help you save space for dining. 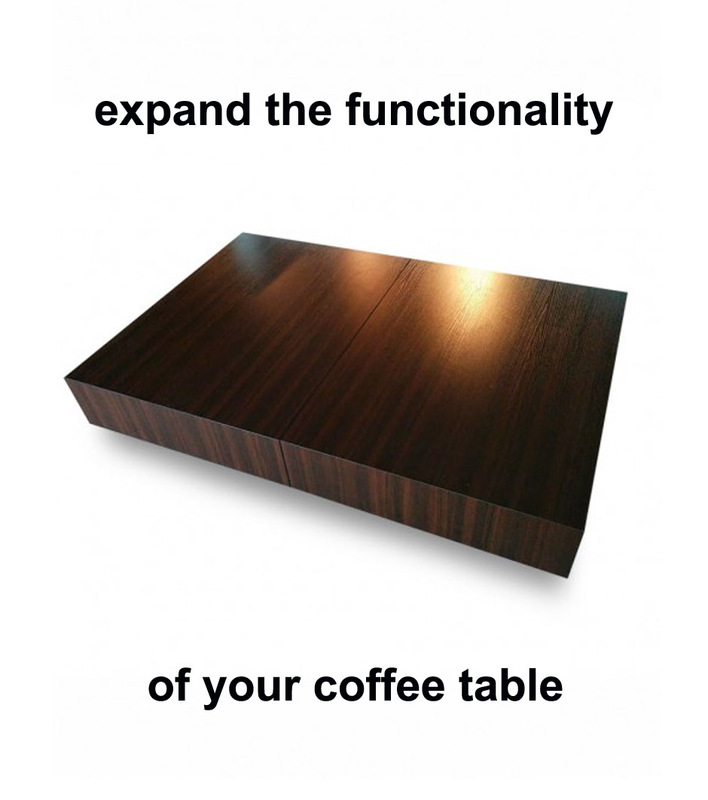 Some space-saving coffee tables include storage compartments, as well. When you lift the top, you reveal small compartments in which you can store DVDs, video games, or remote controllers. You can also store items that you might use for dining, such as cloth napkins, placemats, or salt and pepper shakers. Adjustable coffee tables are also available in a variety of designs and finishes so that you can match the decor in your home. You can choose from wood grain finishes or more modern glossy finishes in a range of colors. The wood grain finishes also have a glossy finish and are paired with sleek designs that combine a modern and traditional aesthetic. You can also choose from different options for the legs and other metal accents, such as a shiny or brushed chrome and other colors. With the right combination of options and the right surrounding furniture, you can create a gorgeous look for any space, whether you have a large home in which you want to get more out of each room or you have a small apartment in which you need to economize space. 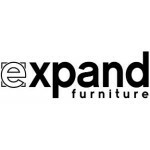 Expand Furniture has a large selection of space-saving furniture for your modern home. 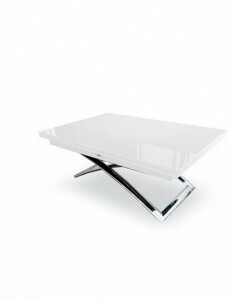 We carry a variety of adjustable coffee table designs, including lifting and expanding tables. Most of our tables include options for customization, such as choosing the panel finish or the leg color. 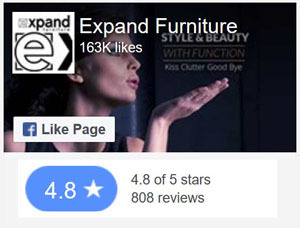 For the other rooms in your home, we carry space-saving furniture such as wall beds, modular shelving and storage systems, folding chairs, and loft systems. 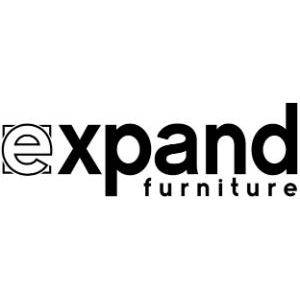 In addition to our space-saving coffee tables, we also carry transforming console tables, accent tables, and expanding dining sets. 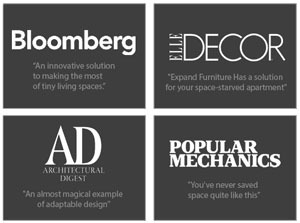 Explore our online catalog or contact us today to find the perfect space saving furniture for every room in your home.